Bring some of that legendary Eventide magic to your tracks with this beautiful sounding and hugely configurable reverb. Extensive preset library. Nine H8000-inspired reverb algorithms. Integrated delay and four EQs. Compressor with external sidechain. Integration of Presets and Snapshots could be better. Lo-Fi effect unpleasant at higher settings. It also includes Equalizer, Compressor and stereo Delay sections, and a Snapshot system for quick access to 32 alternative settings. The AAX version replaces the Anthology II TDM Reverb plugin for users on non-TDM systems (although there's currently no upgrade discount). "The nine algorithms aren't exact copies of H8000 algorithms, but they do share the same underlying code"
Those who make the switch will notice improvements including the slicker interface, an external compressor sidechain, smoother compression and more flexible signal flow. UltraReverb AAX is also session compatible with the original TDM Anthology II Reverb, so will load in its place in TDM sessions. The Equalizer is actually made up of four separate EQs: two 3-band fully parametrics for the Pre/Post EQ sections, high and low shelves for the Reverb Tail, and 3-band with parametric mid for the Delay section. The twin-channel Delay is a straightforward design, with Left/ Right Feedback, Time and Level controls, and Tempo field (host sync or manual). Finally, the Compressor includes a Knee shape setting and external Key input, facilitating sidechaining. Eventide is renowned for its more 'processed' reverbs, but there's plenty here for conventional usage too. Presets are categorised by algorithm type (Hall, Room, etc) and function (Environments, Instruments, etc). 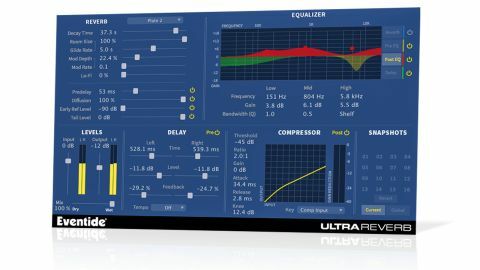 "Great special effects can also be achieved using DAW automation of the Room Size parameter"
UltraReverb also includes some good width-enhancing presets, and some with short Delay settings which can deliver useful proximity. Nonetheless, we prefer its medium and large spaces. Particularly good on vocals are the less dominating Medium Plate presets and - for mid range density - Chamber presets with medium Decay Times. The excellent Hall-based presets are joined by more colourful large spaces using other algorithms. UltraReverb's more creative presets include big special effect spaces, heavily EQ'ed spaces, and quirkiness through high feedback Delay settings. Great special effects can also be achieved using DAW automation of the Room Size parameter, with longer Glide Rates creating smooth transitions as the Size changes. As expected, it's an amazing reverb, but there are some niggles. First, the Lo-Fi effect works best at up to 20% - any higher and it starts to kill transients and sound quite unpleasant. Next, although the Snapshot system is useful, it would be better worked up into a fully fledged Preset/ Snapshot browser/library. Apart from that, this is an excellent, CPU-efficient plugin that delivers rich, characterful reverbs and incorporates a powerful array of tailoring processors.